This page examines the basic climate-related reasons why consumption of animal-sourced food products (even from grass-fed animals) must be drastically reduced as part of any viable food security strategy. Livestock – Livestock emit more greenhouse gases (GHGs) than all transportation. Methane – Methane from livestock is a greenhouse gas 84x more powerful than CO2. Carbon Dioxide – Animal products also multiply CO2 due to extra transport & processing. 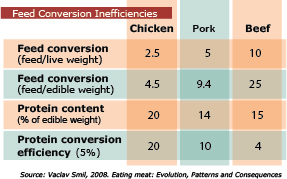 Feed Inefficiency Ratios – Animals eat more food than they produce, which multiplies GHGs. Grass-Fed Cattle – Grazing cattle results in deforestation and triples the methane of feedlots. Recommendation – The most effective climate strategies include minimizing animal products. The United Nations Food and Agricultural Organization (FAO) reports in their widely recognized 2006 Livestock’s Long Shadow – Environmental Issues and Options that the livestock sector generates more greenhouse gases (GHGs) than ALL transportation combined. While 18% is more than all transportation combined, the FAO report (which was produced in partnership with the pro-meat Livestock, Environment and Development LEAD initiative) is conservative. Follow-up analysis by current and former World Bank Group environmental scientists recalculated the Livestock’s Long Shadow numbers, concluding that animal-sourced food production generates approximately 51% of human-caused greenhouse gases. In their “Livestock and Climate Change” article published in the World Watch Magazine Nov/Dec 2009 issue, they analyzed the FAO report, noting what was uncounted, under-counted, and misallocated. Details here. Of critical importance, the new analysis also recalculated the numbers using a 20-year time-frame, instead of the more common 100 years. A 20-year time-frame (which is approved by the IPCC) is more realistic and desperately needed given the dire and immediate consequences of climate disruptions. In short, the extra food that must be produced to raise animals, combined with the extra processing required to turn them into food, leads to much greater carbon dioxide and other GHG emissions. It is widely accepted that animals consume more food than they produce. The differences occur around determining how much more food they consume and to what extent animal feed competes with food for people. The numbers below represent Feed Conversion Ratios (FCRs) for grain-fed livestock.The chart demonstrates how much more food the animals consume than they produce. Grain-fed and/or factory-farmed is the norm for the vast majority (>98%) of meat produced in the United States. See below for different concerns about grass-fed cattle. The chart below indicates a reliable (though notable higher) set of FCRs. Click the link to find more details on Feed Conversion Ratios. Note how live weight ratios are much smaller (more efficient) than the more realistic edible weight ratios. Since these ratios represent live weight, they will be further increased during the slaughter and packaging processes. The inefficiencies can more than double when liquid weight is removed – the weight of the water, blood, and other bodily fluids. Further weight loss occurs with the removal of bones and other non-consumable body parts. Factors that affect the ratios include: type/quality/moisture of feed, animal age, breed, number of offspring, and a host of other variables. Regardless of the exact numbers, raising grain (soy, corn, wheat, etc.) for animal feed is many times more resource-intensive and GHG-producing than raising food for direct human consumption. As illustrated above in the CO2 section, meat-specific processes further multiply the GHG-impact. Grass-Fed Cattle – Worse for Climate Change? Choosing grass-fed beef instead of grain-fed is popular for health, environmental, and animal welfare concerns. However, in some respects grass-fed beef is worse for climate concerns. The digestive processes in ruminant animals (such as cows, sheep, and goats) triple the methane production when consuming grass, hay, and other forage associated with grazing. Proponents point to the carbon sequestration benefits of grazing, but given the strength of methane as a greenhouse gas (see above), the relatively small amount of carbon sequestration pales in comparison to the immense negative impact that methane has on climate change (especially given the half-life differences). The negative impact of grass-fed cattle is furthered by the decrease in photosynthesis that occurs when trees are cleared for grazing land. Photosynthesis is a powerful way to proactively reduce GHGs already in the air (not just reduce the amount of new GHGs put in the air). Recommendations for grazing give more than two acres per cow. While not all that land is tree-bearing, deforestation is a dangerous reality. Some proponents also point to the use of marginal land, but marginal land is a small minority of land used for grazing. Greenwashing occurs, when the public is mislead about fully grass-fed versus partially grass-fed but grain-finished. Even if unintentional, it can also be argued that overstating the environmental benefits of grass-fed beef (such as omitting the climate consequences) is itself a form of greenwashing. Statistics vary greatly based on which components are measured, how they are measured, predispositions of researchers, and a host of other variables. As such, we strive for transparency and use ranges for statistics as appropriate. That said, even the low-range numbers demonstrate the need to drastically reduce the consumption of animal-sourced foods. the consumption of animal-sourced foods. The term “minimize” is used to reflect the realities of culture, economics, and food security in particular areas, while still promoting the most reduction possible. 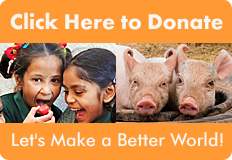 Ideally, eliminating all animal-sourced foods for those who can. Even poultry, which consume “only” twice as much food as they produce, are two-fold wasteful. Poultry only seem efficient because they’re compared to large mammals. Further, the feed convertor inefficiencies do not include the additional land, water, and energy used in all livestock production. Finally, grass-fed beef is not the answer. While there are benefits, there are also pitfalls, namely the increase in greenhouse gas emissions and land use. The deforestation that results for grazing and feed production also causes a great loss in photosynthetic capacity is lost. Even more so, there are massive amounts of grazing land currently in use that could regenerate and increase photosynthetic (thus carbon-capturing) capacity if grazing was decreased. As a side-note, locally-produced meat is also an inadequate alternative. To be clear, the point is not to dismiss alternatives to and critiques of factory farming systems. The point is to demonstrate the immense benefits of minimizing the consumption animal-sourced foods (regardless of production methods) as part of any environmental, social or food justice actions. For the impact of climate change on vulnerable communities, see also the IPCC Climate Change 2014: Impacts, Adaptation, and Vulnerability report.